Karen Wyatt MD, a hospice physician and author participated in a book signing event for her recently published book of hospice stories "What Really Matters" at the LA Times Festival of Books, April 21-22 on the USC campus. Dr. Karen Wyatt signs books at the LA Times Festival of Books. Everyone eventually deals with the issue of death and dying for themselves and their loved ones. ...I always find people who can relate to this book and want to tell me their own story. 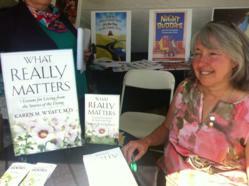 Small-town Colorado family physician and hospice medical director Dr. Karen Wyatt felt right at home in the middle of Los Angeles last Saturday as she signed copies of her inspirational book, "What Really Matters" and chatted with visitors to her booth at the LA Times Festival of Books. The book festival is an annual event held this year on the campus of USC that features authors and publishing companies from around the world. Attendees are able to hear book readings, listen to panel discussions and obtain autographs from their favorite authors. Traveling to Southern California for this special event was a dream-come-true for Wyatt who retired from medicine in order to write the stories of those hospice patients who had dramatically changed her own perception of life. Her book details the spiritual lessons she learned about life from the dying patients in her care over several years' time and serves as a guidebook for those who are trying to navigate difficult times. "Everyone eventually deals with the issue of death of dying for themselves and their loved ones. That's why, no matter where I go, I always find people who can relate to this book and want to tell me their own story," Wyatt said, referring to some of the visitors to her booth. One woman traveled to the festival from San Diego just to meet Dr. Wyatt and thank her for making a difference in her life. Dr. Wyatt reflected, "Hearing that my writing has touched people's lives makes all the effort worthwhile and truly honors the memory of my patients." 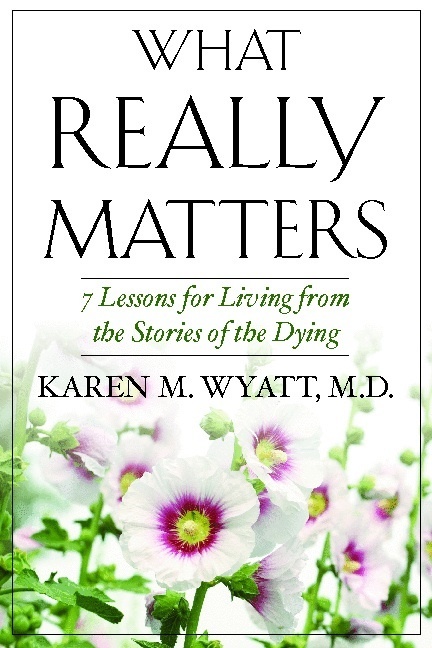 The book, "What Really Matters: 7 Lessons for Living from the Stories of the Dying," was published by SelectBooks and released in February. Since then it has already been featured in articles in USA Today and the Denver Post, as well as many radio broadcasts and local newspapers. Wyatt hopes the book will eventually find its way into the hands of every person who can benefit from its wisdom and she plans to keep spreading the word herself, one autograph at a time.